In my book and podcasts I take you through the background and details of doing The Work. It can be a lot to process, so here are some resources to give you the complete helicopter view! 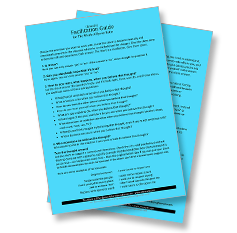 I have created this facilitation guide to support you when you are facilitating yourself or others. It is a one-page step-by-step walk-through of the process plus a back-side with a few helpful thoughts on the central elements. In this condensed video presentation, I walk you through the purely technical side of how to identify your thoughts using a Judge-Your-Neighbor Worksheet. In the second part of the presentation, I walk you through all the basic elements of The Work. ​In this part we cover - among other things - the four questions, the turnarounds and different types of facilitations.